After topping at $233.47 on October 3, 2018, Apple (APPL) dropped to $142.9 for a staggering 39% decline only within 3 months. From $142 low on January 4th, 2019, the stock has rallied and retraced 50% of the drop at $187.9. We think the decline from $233.47 to $142.9 only ended the first leg wave a. 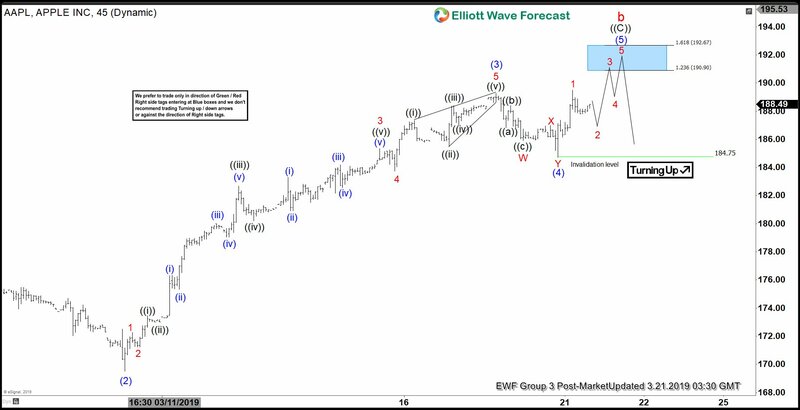 The rally from January 4 low thus is within wave b correction with subdivision as a zigzag Elliott Wave structure. In the short term chart below, we can see the pullback to $169.50 ended wave (2) as part of wave ((C)) of b zigzag. From there, the stock rallied to $189.26 and ended wave (3), then the pullback to $184.75 ended wave (4). Apple is in the process of ending the last leg wave (5) with potential target of $190.9 – $192.67, which is the inverse 1.236 – 1.618 extension of wave (4). This last push higher should also end the wave b correction to the decline from October 3, 2018 last year. As far as pivot at $233.47 high stays intact, it should start to roll over soon or at minimum do larger 3 waves pullback. If RSI divergence is erased in the next leg up, then it could have ended wave ((B)) at $169.50, $189.26 would become wave (1) of ((C)) and $184.75 would become wave (2) and new highs would become wave (3) of ((C)). In this scenario, it should extend higher towards $203.68 – $224.60 area to end the cycle from January 4 low and then turn lower in 3 waves at least.